Some people are naturally good at editing and perfecting things. They are fine with omitting certain parts in order to enhance the work being done. These people know to change and adjust things in order to make it more efficient. 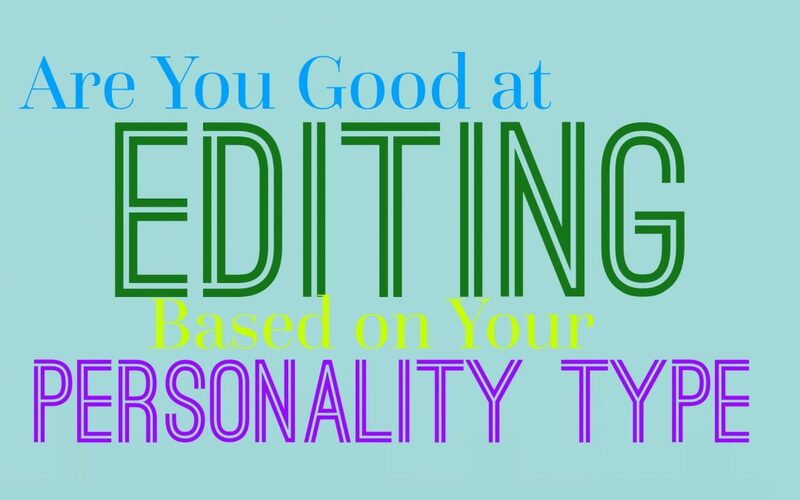 Here is how good you are at editing, based on your personality type. INFJs are often good at editing and ensuring that their work is perfect. This can cause them to spend too much time editing though, and they never really feel like something is finished. They have a hard time ever feeling like they have achieved what they want, since INFJs are often perfectionists. They hold themselves to high standards, but they do make rather great editors because of these standards. ENFJs are often great editors, since they are good at paying attention to details. They don’t want to make any mistakes and believe in striving for perfection. ENFJs put a lot of pressure on themselves to be successful and to get things done flawlessly. For them editing is important and they always work hard to ensure that every detail is finished correctly. For them ensuring that they have edited properly is an important part of the process. INFPs believe in editing with certain things, especially something they are passionate about. INFPs might be viewed as laid back people who are always late for things, but in truth they have a perfectionist side. When it comes to their art or passions, INFPs sometimes struggle to ever feel like this work is finished. When they struggle with these things they often want to edit and spend time perfecting it. They won’t necessarily be great at editing someone else’s work though, since this can feel a bit odd to them. ENFPs really want fans of editing, since this can feel like a daunting task. They don’t like feeling like they have to go through the pointless details, when the bigger picture is still completely clear in the work. For them editing can feel draining and really isn’t their favorite part of the process. ENFPs would rather focus on their creativity and enjoy being able to put together something unique and filled with passion. INTJs are excellent editors, honestly some of the best. They are efficient people who believe in being very precise and always accurate. When something is not perfect they often recognize even the smallest of details and errors. INTJs know when something needs to be edited or taken out for efficiency, and they are great at accomplishing this. They don’t mind being the ones to perfect something, since they are naturally very good at it. ENTJs are efficient people and because of this they prefer that things are right the first the around. They are good at editing and perfecting things, but can become annoyed when something requires too much editing work. ENTJs are very good at solving problems and noticing even the smallest mistakes. This makes them great editors, even if the process does frustrate them from time to time. INTPs aren’t always fans of having to edit, but they do recognize mistakes fairly easily. They often prefer to focus on the process and are naturally very creative people. They enjoy being able to experience new things and jump around without having to obsess over the details. While it might not be their favorite part of the process, INTPs are often capable of editing. This just isn’t something they enjoy doing and so they might put it off for a while. ENTPs are often intelligent and capable people, and this helps them become good at many things. While they might recognize mistakes and are capable of editing, this is something they often dislike doing. For the ENTP having to go over and correct mistakes feels like a draining and completely boring task. They often find themselves wanting to move onto something new when it comes time for the editing process. ISTJs are often excellent editors, since they easily recognize even the smallest of mistakes. It is natural for the ISTJ to notice errors, especially since they are perfectionists. Many ISTJs make for amazing editors, very capable of ensuring that each detail and aspect of the work is done flawlessly. This is something they are good at, and so it’s something they can enjoy. ESTJs are actually excellent editors, since they are such perfectionists. They are great at noticing the smallest of flaws or mistakes and this really helps them when it comes to editing. ESTJs don’t mind jobs like this, since it helps them showcase their skills and make something perfect. They might become annoyed with some people’s lack of efficiency, but that won’t stop them from doing their job. ISFJs can make for great editors, since they are perfectionists. They work hard to get things done efficiently and so they will do their best to edit to a certain level of perfection. ISFJs might not enjoy editing but they are often very good at this type of job. They want to be able to please their loved ones and so they don’t like failing at anything they do. ESFJs work hard to do things to a certain level of perfection, and so they are often capable of being good editors. There are times when they might be distracted or have too many things piling up, and in these situations editing can feel a bit draining and pointless for them. When they aren’t overwhelmed they can certain edit and work to perfect things. ISTPs aren’t usually fans of editing, since these types of details can be a bit draining for them. They don’t like having to deal with perfecting something when it is fine how it is. When it comes time to editing they likely lose interest and find themselves feeling a bit distracted. ESTPs don’t really enjoy having to edit, instead they prefer to experience new things and bounce around a bit. For the ESTP it becomes draining when they have to go over the details and make sure everything is edited perfectly. They are creative people but when it comes to the details they might find themselves distracted. ISFPs are creative people but they usually aren’t fans of having to edit. For them this part of the process can become a bit draining and boring. They find themselves distracted when it comes time to edit, and might feel like jumping onto something new. They can be perfectionists when it comes to their personal work though, and find themselves constantly going over things. ESFPs might be great at editing but they don’t always enjoy the process. They can become bored with having to edit things, and find themselves wanting to move onto something more rewarded. When the ESFP is required to edit they are likely good at it, but they usually find themselves procrastinating this step.